Guillermo Del Toro's epic sci-fi movie, Pacific Rim, is a story about colossal monsters who have been hiding deep in the Pacific Ocean, and suddenly attack mankind. In retaliation, equally massive robots are built, and put under the control of specially chosen fighters. 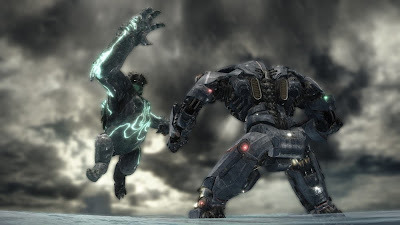 Instead of a usual movie tie-in, you don't strictly follow the story, you just take part in increasingly hard fights, levelling up and upgrading your Jaeger as you progress. The movie looks really damn cool, but movie games don't have a good track record at all, so how does this one hold up? Read on to find out the full verdict! Pacific Rim is a fighting game, pitting the Jaegers against the Kaiju, in 3D, slightly-destructible environments. You start playing as a Jaeger, with more variations available as you progress. Each different robot has different stats, including speed, power, damage and health. They each excel in specific areas, and fall short in others so you have to decide on your fighting style early on. Do you want to be slow and powerful, or weak with quicker attacks? You can choose the perfect one for you and then you can also upgrade them as you win fights and earn cash. Upgrading your Jaeger does become necessary as you progress through the single player mode. The fighting is quite basic, with just a few different attacks at your disposal, so fans of Street Fighter and Dead or Alive will probably not be a fan of this more sluggish fighting style; you can't string together insane combos, it's about carefully using the few moves you do have to bring the enemy down. There is a slight element of strategy to the fighting, as each move takes up energy. Run out of energy and you can't evade or attack, leaving you very vulnerable. The movement is also a bit too slow, but there is a sprint ability, which can be followed up with an awesome rocket-powered punch. It's easy to see why they went for the slow movement, as you're playing as machines or creatures that are hundreds of feet high. You're basically the size of a colossus, from the Playstation 2 masterpiece, Shadow of the Colossus, so the movement is obviously not going to be very nimble. 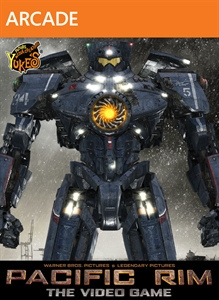 The single player aspect of Pacific Rim: The Video Game consists of a series of missions, which you complete to earn rewards, and unlock new missions. The term "missions" should be taken with a pinch of salt, as each mission is just a one-on-one fight. Some missions don't even make sense, as you have to fight other Jaegers. It makes no sense that on the verge of the apocalypse, you would have practice fights with your billion dollar robots. Sure, it's thrown in for some mission variety, which is great, but in terms of story it makes no sense. 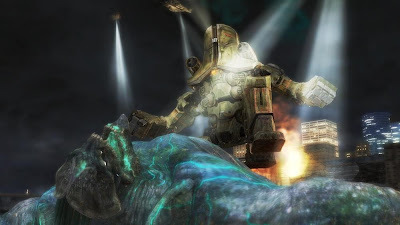 Another early mission promised two Kaiju to take down, but it was simply one after the other. The player's Jaeger even gets all it's health back, and is dropped into battle again, even though it was literally just there a couple seconds ago. It's these small, illusion-breaking things that stick with you, and it gives the impression that Yuke's Co. didn't put too much thought into the single player mode. The multiplayer mode is much more fun than the single player, as real opponents provide a much more challenging fight and won't go down so easy. The only problem is a lot of the fights can be heavily unbalanced, which can lead to unfair bouts. This is due to the matchmaking system. Instead of picking two players with similar skill levels, it throws you together with whoever has mech statistics similar to your own. It's not a true indicator of skill, and it really does show when you try to fight someone who is clearly much better than you. There seem to be a good number of players on though, and there was no trouble finding an online opponent for a quick match. Pacific Rim: The Video Game is a good looking fighter, with huge destructible arenas, and gigantic robots and aliens. It's just a shame then that the combat is slow and way too simplistic, the missions are incredibly repetitive and seemingly random, and the matchmaking is uneven at best. It is a first for a movie tie-in though, as it doesn't follow the story at all, and could pave the way for similar ideas in the future. Fans of the fighting genre will probably find this game too slow, but fans of the movie may enjoy customising their very own Jaeger, and the chance to control a magnificent, ridiculously big robot is pretty damn cool. Play online when you can. Playing against new adversaries is an extraordinary approach to fortify your skills.There are various consoles and diversions to play on the web. On the off chance that you are effective playing on the web, you will be taking care of business.